I'm new to druidry ( still waiting for my OBOD course materials). I have been researching Celtic symbolism. I have found refference to the world tree (Yggdragsil) of Irish Celtic tradition. I just wondered if anyone knows of the welsh equivalent? I also have an interest in Welsh Celtic knotwork and it's meanings so if anyone knows of any good sites please let me know. 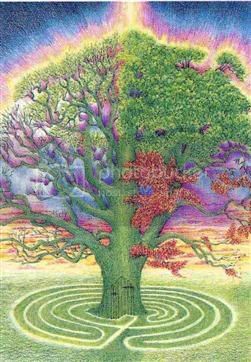 I'm not sure of a specific Welsh equivalent, although the World Tree is a general Shamanic concept: a tree linking the 3 worlds, with its branches in the Upperworld, its trunk in the Middleworld and its roots in the Lowerworld. Yes that is a very interesting picture that clearly marks the changes that the trees goes through at each season it is a lovely depictation. Thankyou for sharing it. Hi there winding branch - nice avatar ..looks like you have a few world trees in there too! Just to clarify something to avoid some confusion - the Yggdragsil is not from Irish celtic tradition. The "world tree" (the sacred ash) belongs to Norse mythology. But Ireland did have very strong "cults" of treelore. The great trees of Ireland were known as "Bile"trees (pronounced "bil-eh" in English) - 5 of them were of very special significance (3 of them were ash trees, the others being oak and yew) and were recorded even in the 12th C Metrical Dindsenchas (a poetic text of person and place name /landscape feature lore). Also many townlands and tribes would have had their own Bile as their totemic tree and several of these are recorded as being the locations of inauguration rites for kings (of petty kingdoms - túatha) and clan chieftains. But these were actual trees and not a mythological"archetype" tree, but had great ceremonial and religious significance. Hence indeed it was an act of war and vandalism for one tribe or kingroup to cut down the bile of another túath...as would sometime be done during raids. From a mythological or pseudo-historical perspective - many old tribal names are derived from trees, because some tribes (in continental Gaul and Ireland and maybe Britain too) adopted a certain type of tree as an "ancestor" - hence you get the Dervones (the 'oak people') the Eborovices (the 'yew conquerers') and the Eoghanacht (from 'yew conceived') - an Irish tribe recorded from about 2 AD in Munster I think - one of the largest tribes from which many of us spring from!). I chose the avatar because it was interesting and different and I really love trees as they are so varied and interesing to look at. I also find being encircled by trees in a wooded area more calming than anything else. Thanks for clearing up the confusion re the world tree. The problem with online study is that you don't always get accurate information. I did not know about the bile trees of Ireland or about the totemic trees, how interesting. Which way do the spirals go on the world tree. Do you go counterclockwise to go up or down. Do you go to the right to go down, and left to go up? Or do you always go to the right. Yes, Yggdragsil is Norse and an Ash tree. More curious to me is that mankind still reveres the Yew, albeit sub-consciously. Think of the ancient Yews found in churchyards, often at the gate, representing the gateway to the underworld, many churches having being built on Pagan worship sites but preserving the sacred Yew trees. Most curious. "Be not afraid little one, for you walk in the footsteps of Giants."